These are the second item's I tried back in Udon Thani in July 2011 (the first was the very impressive Kapraw Chicken Rice), click the link below to find out how the Tuna Pie, and the Chick n' Cheese held up after being impressed by the rice! First off, I would like to apologise for another older review, I know the items that I sampled a before I started this blog are never as detailed as the newer ones, but I just haven't been able to travel for the last month and a half. I'm nearly finished with my studies, and hopefully will be able to find a job which allows me to be able to continue my travels. If anyone reading this is compelled to offer a job to a soon-to-graduate Canadian willing to relocate anywhere, send me an email using the contact information at the bottom of this page. Rather than explaining the same information about the location I'll just refer you to the Krapraw Chicken review where you can read more about where I was and the time I was ordering. Though I didn't mention it in the first review, but I ate these while I was waiting for my rice to be delivered, and to be honest, they were so horrible, I almost gave up on the rice while I was waiting. I looked at a couple other reviews of the Tuna Pie, and they are generally pretty favourable, but personally, I thought it was pretty disgusting. The pie shell was rock hard, which gave it a significant crunch, so it was off-putting with the soft, warm, tuna centre. Even the tuna was pretty gross, it was a tuna purée that you get in various Asian countries, and I'm pretty sure it had some mayo or something similar mixed in. Another problem was the size. Normally, a McDonald's pie would last me 3-4 bites, but if you look at my photo, you can only see a small portion of the pie left, and that was after the first bite! It was easily the smallest McDonald's pie I've ever had. 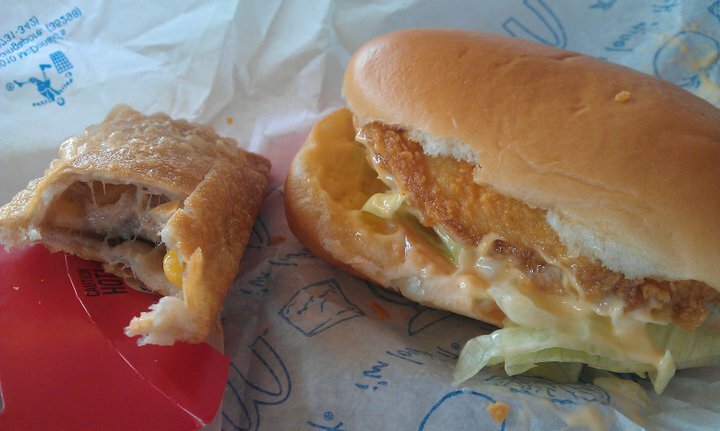 The only reason it didn't get a 1/5 was because it had corn inside, and anything with corn deserves at least 2 stars. As disappointing as the Tuna Pie was, the simple Chick n' Cheese was even worse. It seems pretty hard to go wrong with a small snack size sandwich, a chicken strip, lettuce, tomato and cheese. In theory it should be pretty good, it even looked decent enough (I am judging it by what it is, a fast food sandwich) but when biting into it I had the most vile cheese sauce I've ever had at McDonald's. I called it cheese sauce, as it tasted nothing like any cheese I've ever had before. It was overpowing, and even when trying to salvage the chicken strip from the sandwich and eating it alone, I still couldn't stomach it due to the smell. I rarely don't finish an item I order, and even though it was only 3-4 bites in size, I still threw more than half away. 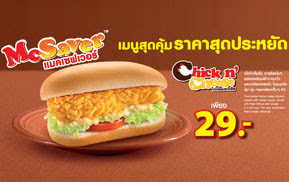 The Tuna Pie has come and gone, but the Chick n' Cheese still remains, haunting me every time I revisit a Thai McDonald's. I'm always open for questions, comments, feedback on what I can change/improve upon, or anything else at all, just leave them at the bottom of the page. Just remember, in Thai McDonald's always order the rice.